Formed in 2003, Steffen Spiele is the creation of Steffen Mühlhäuser, a graphic designer who began designing games in the mid 90s. Since then, Steffen Spiele has published well over a dozen of his designs in their characteristic no-wasted-space game boxes. 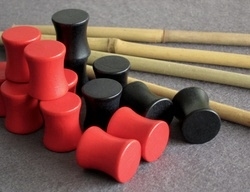 Almost all of the games include chunky wooden components. Foxmind have picked up several of the Steffen Spiele games and published them in English markets, but the others can be easily picked up and played since the rules are typically simple and easily translated. Scho K. O: A light tile-laying game with a chocolate theme. Players lay tiles with light and dark chocolate in an attempt to create the largest continuous area in their own colour. The game is more interesting because a few of the tiles include a smartie and can be used to either create a second layer to break up groups, or be used defensively. Six: A game of placing hex-pieces to try and be the first to create a circle, a triangle, or a row of 6 pieces. Once players are good enough to play all their pieces to a draw, the second phase starts where pieces can be moved around the playing surface and whole groups captured if they are isolated. Linja: A leap-frogging race game over a corridor of bamboo sticks. Players take it in turns to make a double move, the first is a single step, but the second can be a giant bound if you can take advantage of other pieces already on the board. Players must strive to get their pieces as close to the home row as possible by the time the two groups are finally separated.